Polyurethane Wheel Casters offer much more floor protection than many other types of wheels while still providing superior floor protection and easy roll-ability. Plate Size: 4-1/2" x 6-1/4"
Polyurethane Wheels offer many beneficial characteristics compared to a standard Rubber, Plastic, Phenolic, or Steel Wheel. Polyurethane material can range from 85 Shore A Durometer to 95 Shore A Durometer on the Hardness Scale. Polyurethane offers much more floor protection than many other types of wheels while still providing superior floor protection and easy roll-ability. Polyurethane tread wheels can be seen at many large retail chain stores including on the heavy duty carts used by Home Depot, Lowes, and many other large stores. Polyurethane wheels are great for both indoor and outdoor applications, holding heavy loads, quiet / smooth rolling operation, and offer great floor protection on laminate, tile, concrete, some wood, and most floor types. Depending on the wheel Durometer selected you will receive different benefits. The softer 85 Shore A Durometer Polyurethane Wheels offer a significant reduction in Noise Decibels while rolling; Rolls over Gaps, Debris,Screws, Glass, and Wires much easier than a higher 95 Shore A Durometer wheel. Then again, a 95 Shore A Durometer Polyurethane wheel offers other benefits including; Easier Push/Pull Force to initiate cart and start rolling from a complete stop, better push/pull results depending on type of hardness, bearings, floor, and easier turning maneuverability. Different type of Polyurethane materials are better for certain applications. If you need a recommendation please give us a call or email us your application, total carts loaded weight capacity, and floor type. We will help you find the right caster the first time. Optional precision ball bearings and tapered roller bearings require less effort to start up and maintain a rolling load; they also generate less friction heat and may prolong the life of the wheel. 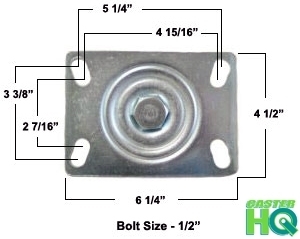 Works well in both indoor and outdoor environments; however cast iron core can rust; if this is an issue look at using aluminum or plastic core wheels. 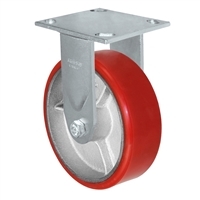 4" x 2" Red Polyurethane on Iron Wheel | Rigid Caster | Capacity: 700 lbs | Plate Size: 4-1/2" x 6-1/4"
Mounting Plate: 4-1/2" X 6-1/4"
4" x 2" Red Polyurethane on Iron Wheel | Swivel Caster | Capacity: 700 lbs | Plate Size: 4-1/2" x 6-1/4"
5" x 2" Red Polyurethane on Iron Wheel | Rigid Caster | Capacity: 1,000 lbs | Plate Size: 4-1/2" x 6-1/4"
5" x 2" Red Polyurethane on Iron Wheel | Swivel Caster | Capacity: 1,000 lbs | Plate Size: 4-1/2" x 6-1/4"
6" x 2" Red Polyurethane on Iron Wheel | Rigid Caster | Capacity: 1,200 lbs | Plate Size: 4-1/2" x 6-1/4"
6" x 2" Red Polyurethane on Iron Wheel | Swivel Caster | Capacity: 1,200 lbs | Plate Size: 4-1/2" x 6-1/4"
8" x 2" Red Polyurethane on Iron Wheel | Rigid Caster | Capacity: 1,400 lbs | Plate Size: 4-1/2" x 6-1/4"
8" x 2" Red Polyurethane on Iron Wheel | Swivel Caster | Capacity: 1,400 lbs | Plate Size: 4-1/2" x 6-1/4"